During WWII, Palau was a strategically important island chain, utilized by Japanese Imperial Forces for both supply and a base from which to launch combat operations. Subsequent to the raids on Truk, the U. S. Navy continued its westward sweep and launched Operation DESECRATE I in March 1944. During the operation naval fighter sweeps sank more than 60 ships. The raids were a preliminary "softening up" prior to an invasion that resulted in the famous battle at Pelileu. The Helmet Wreck is an unidentified Japanese cargo ship sunk in Koror Harbor by Allied bombing. 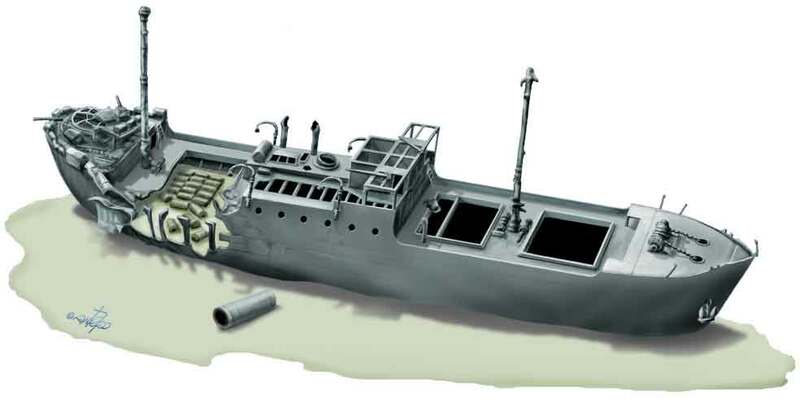 The ship shows extensive damage and contains a stern gun, shells, depth charges and radial engines for zero fighters. She also contains a cargo of Japanese personnel helmets. Due to her location, visibility is usually poor. She now lies in 95 fsw.